With no central heat or insulation, the Florez’s home felt like an ice box in the winter. The family budget was tight each month, but Melanie Florez didn’t hesitate to buy three space heaters and extra blankets to keep her three kids warm. She even made sure they dressed in extra layers to endure the chill. Unfortunately, even with space heaters running constantly, it wasn’t enough to warm the entire house. In desperation, Florez began turning on the oven full blast and leaving the oven door open to add warmth — likely not realizing she was creating a dangerous fire hazard. Summers were just as uncomfortable and unaffordable for the family. Everything changed when the family qualified to get help through CPS Energy’s Casa Verde program, which offers an average of $5,000 of insulation and other energy-saving improvements for free. Troy, 9, and Isaiah, 4, pose in front of the wall furnace installed for free last winter through Casa Verde. Employees of the Casa Verde weatherization team reviewed Florez’s proof of income and other documentation to confirm her eligibility. Renters of single family dwellings like Florez can apply for the program. Florez simply made sure that her father, who leases the home, helped complete the landlord permission form. Next, a contractor assessed the home to make sure it was structurally sound and could benefit from weatherization. The contractor identified the most cost beneficial energy efficiency improvements and gave the thumbs up for work to begin. Florez received attic and wall insulation, weather stripping to doors and windows, and solar screens. A new vented wall furnace replaced the inefficient space heaters, making the home both safe and energy efficient. The Casa Verde team then inspected the work to confirm it was complete and done with quality. The Florez family is now enjoying lower bills and a more comfortable environment in their home. If you or someone you know needs help like the Florez family, please join us for CPS Energy’s Community Programs Fair on Sat., Oct. 25, 10 a.m. – 2 p.m., at Collier Elementary School, 834 W. Southcross Blvd. 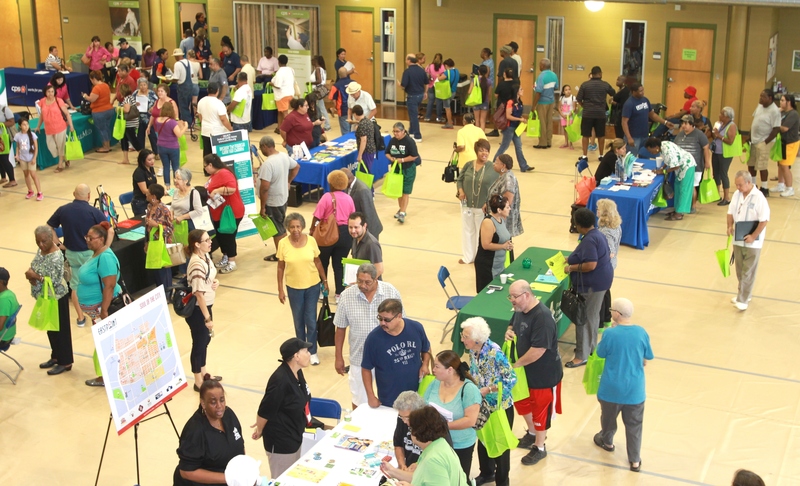 Much like this Community Programs Fair on Sept. 20, customers will get a chance to apply for Casa Verde and other assistance programs at a fair on Oct. 25. CPS Energy employees will help customers determine their eligibility for Casa Verde and start the application process. If you’re eligible, an employee will schedule a contractor to assess your home on the same day to make sure it’s structurally sound and can benefit from weatherization measures. Once the application process is complete, the free energy efficiency installations can begin. On average, it takes about 12 to 15 days to complete installations and receive a final inspection. Employees also will be available to provide information about other assistance programs and electrical and gas safety for your home. Several other community organizations will be present to provide helpful information about their programs and services, including the San Antonio Water System, the San Antonio Foodbank, WIC, the Gonzaba Medical Group, WellMed, UnitedHealthcare and the Green & Healthy Homes Initiative. Florez hopes that many other families in her neighborhood will apply for Casa Verde and experience the benefits her family received. To apply for Casa Verde or any other of our helpful programs, visit cpsenergysavers.com for more information.